It now seems that almost every week we are getting a superhero movie or something based on a comic book. I am a fan of these movies, particularly if they come from Marvel but I must admit that I am starting to tire of them. After the spectacle that was Avengers: Infinity War, the bar was set so high that so far, the films released after that have failed to hit the mark. So now comes Venom, a villain/hero who made his debut in Sam Raimi’s Spider-Man 3. Given his own film, this should have been a darker, more horrific affair. Instead, we have a mess that just doesn’t know what to do with this character. Eddie Brock is an investigative reporter with a near-perfect life with a beautiful, lawyer girlfriend and hit TV show. When he interviews scientist and entrepreneur Carlton Drake and Drake doesn’t like his line of questions, Brock loses everything. Drake has been using homeless people to experiment with symbiote from outer space, who enter their bodies but are being rejected. Investigating Drake’s business, Brock soon becomes the vessel for one of the symbiotes called Venom. Director Ruben Fleischer has pulled together two A-listers, has the backing of a major studio as well as Marvel but has delivered a low-grade B-movie that is suffering from an identity crisis. Like the recent release A Simple Favour, this is a film struggling to find a genre and sticking with it. Origin stories are always tricky to get to grips with but this is all over the place. Starting off in sombre tones, you believe you are heading down the same route like Logan. Then it starts injecting bizarre humour so it looks more like Deadpool and the final act is a mix of confused Incredible Hulk action. 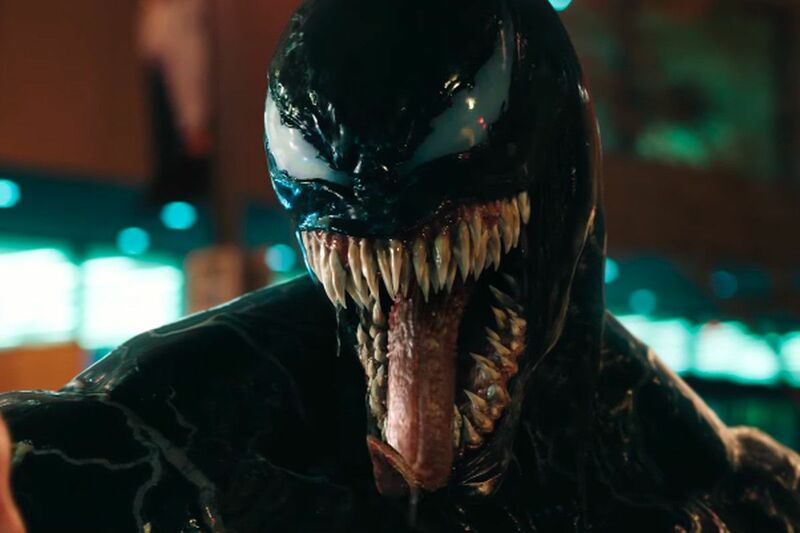 Venom was always a dark and vicious creation that played with the colour and fun of the Spider-Man universe, which should have been a welcome angle among the usual superhero fare. Yet with the off-balanced tone, the film feels slow and awkward for the first half and just becomes more strange to the point of curiosity. The ending, however, is almost impossible to watch as a battle between symbiotes is filmed so close, you really have no idea what is going on. Because of this, you find it hard to care and the levels of excitement drop to the point that, for the first half at least, you find yourself checking your watch and wondering when the film will kick in. When it does, the reaction is one of pure confusion, as if this was tacked on from another movie. It’s perfectly fine to mix genres but you need to have a director who can handle this without you really noticing. Fleischer cannot do it. The disjointedness can also be felt in the performances, although the three leads inject their own levels of energy. Riz Ahmed is perfectly slimy as the villainous Drake, bringing an air of superiority to a character that could have been a stereotype. The always excellent Michelle Williams delivers an air of class to her role of Anne Weying but seems to be in the wrong film thanks to the oddness of the genre mixing. However, Tom Hardy as Eddie seems to have the right idea. Go as over-the-top as possible. He throws caution to the wind and just goes with it. He knows this is nonsense and he just doesn’t care. The scenes where he is conversing with his alter-ego are tremendous fun and without him, this could have been a total disaster. 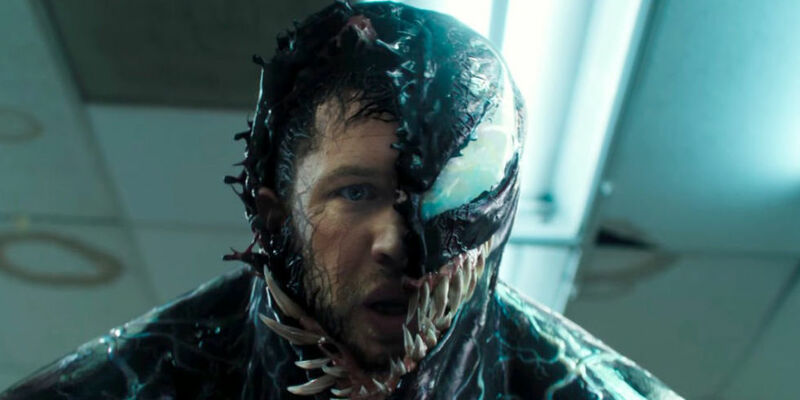 Venom had all the making of a very different superhero movie. Instead, it is a messy, confusing and surprisingly dull affair that is saved by its own bonkers attitude by the end and Hardy’s infectious performance. With the promise of a sequel (see the post-credit sequence) they are going to have to work much harder in controlling the tone and mood.